Geographic tracts identified as 25 federal Opportunity Zones were announced April 19 by the state’s Economic Development office in a move to spur private projects in distressed areas of the state. To be eligible, each tract’s population had to meet the criteria according to the U.S. Census data, said Britteny Cioni-Haywood, the director of the Alaska Division of Economic Development. “The criteria was a poverty rate of at least 20 percent or a median family income in the tract that was 80 percent or lower than the statewide median income,” Cioni-Haywood said. The median family income in Alaska is currently at $69,825. An individual median salary is $34,187 in Alaska. The federal poverty level is defined as an income of $12,060 to $16,643 per individual or $24,600 to $33,948 per family. The Treasury Department identified 60 low-income tracts in Alaska out of 167 tracts overall. The state Division of Economic Development then was asked to whittle the list down to 25 that are now qualified as federal Opportunity Zones. Letters of application came from community leaders and investors. The criteria for selection are based on economic hardships, geographic representation, project feasibility, alignment with existing initiatives and community support. In the next 10-year life of the federal OZ designation, investors can defer taxes on any prior gains, so long as the gain is reinvested in an investment vehicle called the Qualified Opportunity Fund. The IRS is currently working on guidance for businesses on how to take advantage of the tax credit, according to the Department of Revenue, which issued a news announcement April 9 after the first round of newly enrolled OZs were announced. Certain Alaska tracks may come as a surprise: the Joint Base Elmendorf-Richardson is one. Fort Wainwright and downtown Fairbanks where a performing arts center construction is planned are other designated tracts. Disadvantaged areas ripe for investment to create jobs and better family incomes were identified from the North Slope to Bering Strait to the Upper Kuskokwim and down to Hoonah, Wrangall and Prince of Wales Island. The tracts selected don’t include cities such as Nome, Kotzebue, Utqiagvik, Craig or Klawock in the south where income opportunities are higher than other areas. Seven are in Anchorage, including Spenard, Fairview, two areas of Muldoon, Midtown, and Ship Creek. On JBER, a proposal by J&L Properties is to build new housing units for military personnel. State Reps. Gabrielle LeDoux, R-Anchorage, and Ivy Spohnholz, D-Anchorage, and Sen. Bill Wielechowski, D-Anchorage, all advocated for J&L Properties as “a leading Alaska real estate and development firm” that has “expressed a tremendous interest in this designation for possible development projects,” their letter stated. They represent districts that include an area of East Anchorage where J&L also has proposed more housing. Anchorage’s census tracts 10, 14, 19, 20 and 21, known as Fairview, Midtown and Spenard neighborhoods, were identified in “numerous community plans,” wrote Emma Kelly, the business and economic development director for the Anchorage Economic Development Corp., in the application. “The City of Anchorage, in partnership with AEDC’s Live.Work.Play. initiative as well as Anchorage’s near-complete Comprehensive Economic Development Strategy… all identify benefits that would result from increased private sector investment in areas including housing, education, transportation, crime and safety,” Kelly wrote. Fairbanks tracts are in the area where housing will be needed for some of the anticipated 1,635 new personnel arriving at Eielson Air Force Base with the stationing of 54 new F-35 fighter planes, said Jim Dodson, president and CEO of the Fairbanks Economic Development Corp., or FEDC. The two new F-35 fighter jet squadrons are expected to arrive in 2019 and 2020. After analyzing the vacancies available in the Fairbanks, North Pole and Salcha areas, the FEDC concluded each of these borough communities need more housing to accommodate the squadrons, Dodson said. In Fairbanks-North Pole area, 200 to 500 housing units need to be built, Dodson said. The FEDC has been conducting outreach to entice investors so far slow to move into Fairbanks to build the necessary housing, he said. “Maybe the tax cuts will help,” he said. 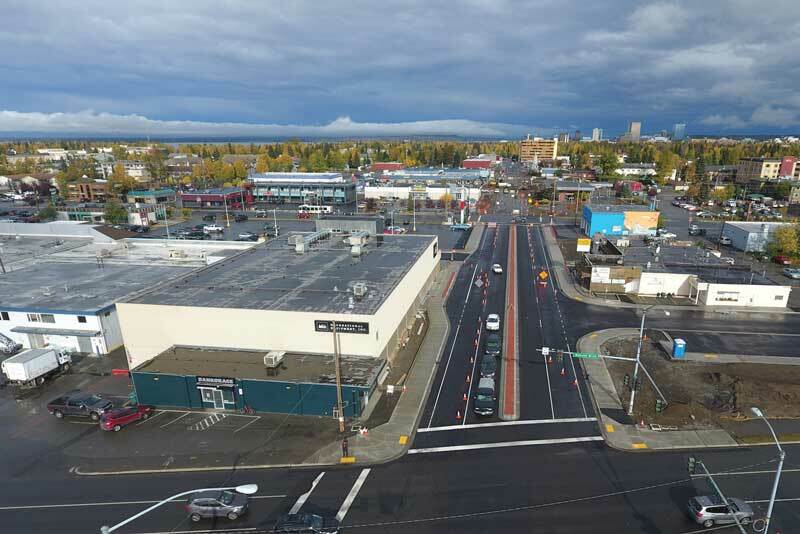 Fairbanks North Star Borough Mayor Karl Kassel wrote of the hardship the area has endured, as cited in the April issue of Alaska Economic Trends. Some of the largest employer cuts were from the University of Alaska Fairbanks where 500 people have lost their positions and numerous retail jobs were lost when Sam’s Club and Sports Authority closed. Kodiak also made a strong pull to become enrolled as a federal OZ, but Kodiak wasn’t selected. No tracts on Kodiak Island were selected in the final cut of 60 communities to 25 OZs. City Mayor Pat Branson, in her letter nominating Kodiak, listed the need for “redevelopment” projects for seafood and tourism, expanded wind capacity on Pillar Mountain and a new seafood processing plant. Areas of the Kenai Peninsula also were not selected, though several qualified. In Southeast Alaska, Hoonah, Angoon, Haines Borough, Wrangell and Metlakatla all occupy tracts that were selected as federal OZs. Alasks Power & Telephone was one of the businesses advocating for selection; plans in Southeast include increasing broadband capacity for Skagway, Haines, Prince of Wales Island and Metlakatla, wrote AP&T President Michael Garrett. Prince of Wales Island-Hyder Census Area in Southeast Alaska has nearly 17 percent living in poverty and annual unemployment for the past eight years has between 11 and 13.4 percent. Two investment projects pushed in its nomination are Dotson Ridge rare earth mining project that would recover rare earth elements essential for components needed in high tech domestic and military applications, wrote Craig City Administrator Jon Bolling. Another is an Angoon hydro project. Many projects named in the OZ applications are shovel-ready, Cioni Haywood said, and had been sought by communities for several years prior to the creation of OZs. EIG lobbied Congress to set up OZs based on similar programs in the past: the “empowerment zones” of President Clinton’s era and the “enterprise zones” of the President Reagan era. A recent analysis by the Brookings Institute raises questions, and warnings, about how OZ investments might not work as intended. The tax incentives could become a sweet deal for projects that already promise return on investment, but not so much in “deeply impoverished areas where rents and property values are stagnant,” wrote author Adam Looney. He warned against turning a low-income neighborhood into a more upscale one via housing projects if it displaces low-income people and creates fewer places instead of more where they can afford to live. Correction: The original version of the story stated that AT&T was pursuing a project in Southeast. It is actually AP&T, Alaska Power & Telephone.